English is a complex language to both understand and use. There are often dozens of different ways to express a single thought or idea in words. On top of that, there are confusing language elements like homonyms, jargon, loaded words and other awkward word combinations that can trip us up. Even adults who’ve been using English their entire lives can’t be faulted for consulting a dictionary to make sure they’re using a word correctly or to see if what they’re saying makes sense. 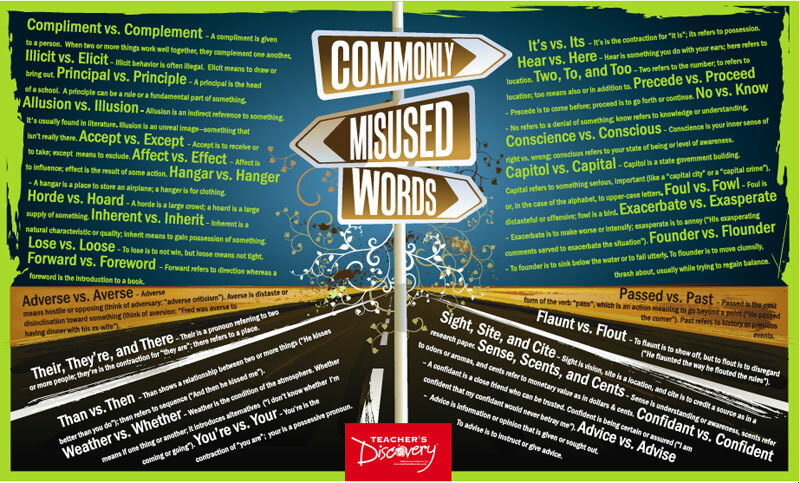 It would be nearly impossible to put to rest every question about misused words in a single blog post, but today we decided to share some of the most common ones we’ve come across. Then we’ll leave it up to you to ask any lingering questions you still have or, better yet, share your own tips. When spoken, the contraction “could’ve” usually comes out sounding like “could of”, however this is not correct. Instead, the correct spelling is always could’ve. This goes for could’ve, should’ve, would’ve, must’ve, etc. Desert vs. Dessert – A “desert” is a dry, arid region. Also, it could be a verb meaning “to abandon.” “Dessert” is a dish served at the end of the meal. Think about it this way: when it comes to desserts, you should always ask for a second helping of the “s”. Then vs. Than – “Than” is used to compare two things, while “then” tells when. Toward – There is no “s” at the end of the word, even though when spoken the “s” may sound natural.